Limited Edition: 60 copies Worldwide. Notes: These covers are printed on the finest quality linen textured paper and then lovingly hand made into envelopes. 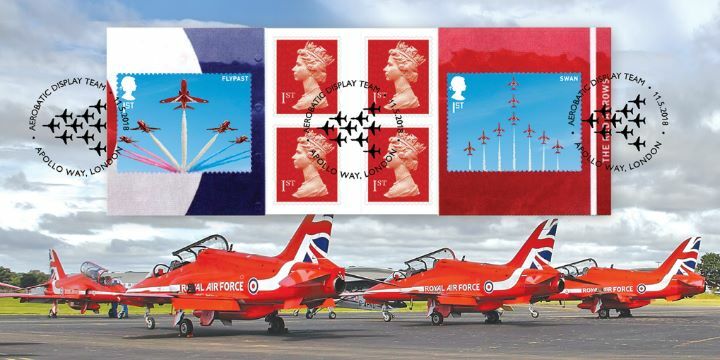 The above Royal Mail RAF Centenary stamps were issued on 11 May 2018 by Royal Mail and feature the following stamp designs: . The Red Arrows - RAF Stamp Book 2 first day cover with the London, Apollo Way, Special Handstamp postmark has been produced by Bradbury and features these stamps which can make a very collectible and lovely gift.